By Matt Bar­rie & Craig Tin­dale. I recently watched the fed­eral trea­surer, Scott Mor­ri­son, proudly pro­claim that Aus­tralia was in “sur­pris­ingly good shape”. Indeed, Aus­tralia has just snatched the world record from the Nether­lands, achiev­ing its 104th quar­ter of growth with­out a reces­sion, mak­ing this achieve­ment the longest streak for any OECD coun­try since 1970. I was pretty shocked at the com­pla­cency, because after twenty six years of eco­nomic expan­sion, the coun­try has very lit­tle to show for it. 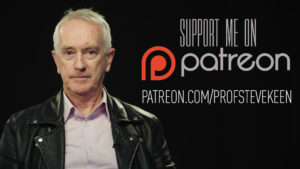 I have recently estab­lished a Patreon site https://www.patreon.com/ProfSteveKeen, where peo­ple can sup­port my research and advo­cacy work with dona­tions start­ing at $1/month. That is now where I will engage in con­ver­sa­tion in response to posts. So if any­one here wants to con­tinue a dia­logue with me and oth­ers, please sign up there. This site was flooded by a large num­ber of spam users at the same time as I became unable to main­tain my own role in dis­cus­sions here, since I am just too damn busy in Lon­don. This has caused the site to be sus­pended three times by its ISP for per­for­mance issues. One more time and the account will be banned. I have there­fore decided to delete all users on this site, bar those who have made posts (which is a hand­ful of indi­vid­u­als of course). I’m tak­ing part in a debate on one of the major top­ics in this year’s elec­tion, Brexit, on May 31st at 7.30pm at Can­ham, 40 Sheen Lane, Lon­don SW14 8LW. The other speak­ers are Frances Cop­pola, and Angus Arm­strong. Frances Cop­pola is an eco­nomic com­men­ta­tor in print and fre­quently on the BBC. Angus Arm­strong is direc­tor of macro-eco­nom­ics at one of the top research insti­tu­tions, the National Insti­tute of Eco­nomic and Social Research founded in 1938. Click here to buy tick­ets for this event. This site’s signup secu­rity failed, and some­thing like 50,000 bot-users have signed up. What if my analy­sis is used for evil pur­poses? Hi Steve, thank you, you’ve given me the gift of some of the most impor­tant ideas and expla­na­tions I’ve come across in my life­time. Can we avoid another finan­cial cri­sis? 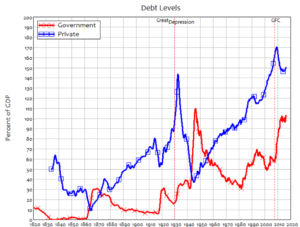 In 2008, con­ven­tional eco­nom­ics led us blind­folded into the great­est eco­nomic cri­sis since the Great Depres­sion. Almost a decade later, with the global econ­omy wal­low­ing in low growth that they can’t explain, main­stream econ­o­mists are reluc­tantly com­ing to realise that their mod­els are use­less for under­stand­ing the real world. As I explain in this video, gov­ern­ment attempts to turn Uni­ver­sity entrance into a mar­ket­place have had the unin­tended side-effect of under­min­ing plu­ral­ist eco­nom­ics. The UK gov­ern­ment has removed con­trols on the num­ber of places that Uni­ver­si­ties can offer in first year courses, and as a result there has been an increase in human­i­ties places offered by highly ranked Uni­ver­si­ties. Final year high school stu­dents have flocked to these Uni­ver­si­ties, and enrol­ments at lower-ranked Uni­ver­si­ties have fallen sub­stan­tially. A new organ­i­sa­tion called NEKS (for “New Eco­nomic Knowl­edge Ser­vices”, see www.neks.ltd) is hold­ing its inau­gural con­fer­ence on the eco­nom­ics of infra­struc­ture In West­min­ster on Tues­day Jan­u­ary 24th, and you should attend. Why NEKS, and why Infra­struc­ture? The eco­nomic impor­tance of infra­struc­ture is obvi­ous, but the actual per­for­mance of infra­struc­ture often dif­fers rad­i­cally from what is pre­dicted when it is being planned. Three forms of delu­sion make many infra­struc­ture projects far less ben­e­fi­cial than expected by their pro­po­nents: the com­plex­ity of exe­cu­tion is under­es­ti­mated, the ben­e­fits are over­es­ti­mated, and ben­e­fits are also cal­cu­lated poorly using dodgy eco­nomic the­ory. This is a talk I gave in Ams­ter­dam to launch the Ams­ter­dam Rethink­ing Eco­nom­ics cri­tique of the cur­rent state of eco­nom­ics “edu­ca­tion” in the Nether­lands. The text of my slides is repro­duced below. I’ve had some tough inter­views over the years (such as the BBC HARDtalk! inter­view ear­lier this year with Stephen Sackur), but I’d have to credit the stu­dent inter­view­ers at the Uni­ver­sity of Amsterdam’s Room for Dis­cus­sion event with giv­ing me the tough­est, well-informed grilling my ideas have had in pub­lic. I’m fol­low­ing up later today with a keynote speech at the Dutch Rethink­ing Eco­nom­ics event tonight, and I’ll post that here later this week.